Home Real Estate Mortgage What is APR? When shopping for a loan or line of credit it’s important to find a low annual percentage rate or APR. Here’s a look at what is APR. 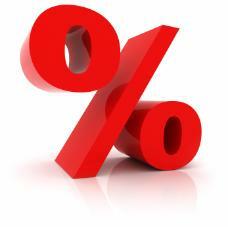 APR, or annual percentage rate, is the annual cost of borrowing money, expressed as a percentage. For example, of the APR for a loan is 10%, borrowing $120 would cost you $12 a year or $1 per month. The terms APR and interest rate are often used interchangeably. However, the APR actually includes the interest rate along with other fees associated with the loan. So in reality, the APR for a loan might actually be higher than the loan’s interest rate. The government requires banks to disclose the APR for loans, so banks won’t lure borrowers by advertising a low interest rate then tacking on extra fees. Comparing loans using the APR lets you tell whether you’re getting a good deal. As long as everything else is equal, a loan with a 3% APR is cheaper than a loan with a 6% APR. To be sure you’re getting a good deal, it’s a good idea to request a list of fees associated with the loan. Then, not only can you compare the APRs, you can verify the lowest cost loan by comparing fees charged with each. When you see the APR for a loan product, it may be described as the effective APR or the nominal APR. Note that these two rates represent different things. The nominal APR is the simplest type of annual percentage rate noting just the amount of interest charged on the loan each year. The nominal APR doesn’t take into account any fees added to the loan. On the other hand, the effective APR does include feesand loan costs in addition to the interest rate. The effective APR, if fees are charged, will be higher than the nominal APR. For example, the APR on a mortgage may include fees like origination fees, private mortgage insurance, and underwriting fees. However, certain fees associated with the home purchase aren’t typically included in the APR, e.g. appraisal fee, title fee, and home inspection fee. A loan with a lower interest rate could be more expensive than a loan with a higher interest rate after you consider fees. For example, a 30-year $100,000 loan with a 4% interest and $10,000 in fees would actually have an APR of 4.81%. A loan of the same amount and term with a 4.5% interest rate and $2,000 in fees has an APR of 4.67%. The loan with a higher interest rate lets you pay $3,000 less over the life of the loan because the loan actually has a lower APR. A loan’s APR can be fixed or variable. Fixed APRs remain the same throughout the life of the loan. The fixed rate APR on a loan never changes. Because the APR never changes, the monthly payment doesn’t change. To get a lower interest rate or lower monthly payment, you would have to refinance the loan, which basically involves paying off the old loan with a new one. By comparison, fixed APRs on a credit card can legally change if the credit card issuer gives a 45 days advance notice. Variable and adjustable APRs, on the other hand, do change throughout the loan. Mortgage APRs that change are known as adjustable rate mortgages. At the beginning of the loan, the adjustment period is set, so you know exactly when to expect the interest rate to change; you just don’t know how much it will change. You also don’t know how much your monthly mortgage payment will be once the interest rate changes. Credit cards with variable APRs change without notice based on changes in another interest rate, like the Prime Rate. Previous articleWhat is a Credit Line?